This Yellow Labrador Retriever sitting on a step is available as a limited edition Giclee print, signed and numbered by Jane Partin. 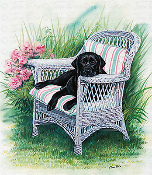 This Black Labrador relaxing on a wicker chair is available as a limited edition print, signed and numbered by Jane Partin. 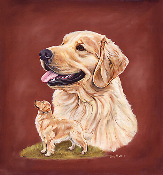 This Golden Retriever portrait is available as a limited edition Giclee print, signed and numbered by Jane Partin. This Yellow Labrador Retreiver standing in some reeds is availble as a limited edition print, signed and numbered by Jane Partin. This painting of a Black Labrador watching geese in winter is available as a limited edition print, signed and numbered by Jane Partin. This painting is of a Black Labrador sitting on the Chesapeake Bay. It is available as a limited edition print, signed and numbered by Jane Partin. This portrait of a sleepy Black Labrador is available as a limited edition print, signed and numbered by Jane Partin. This Black Labrador waiting by an outhouse is available as a limited edition print, signed and numbered by Jane Partin. This patriotic portrait of a Yellow Labrador, a Chocolate Labrador and a Black Labrador in front of the American Flag is dedicated to the service dogs of 9/11. This Black Labrador on the Chesapeake Bay is available as a limited edition print, signed and numbered by Jane Partin.